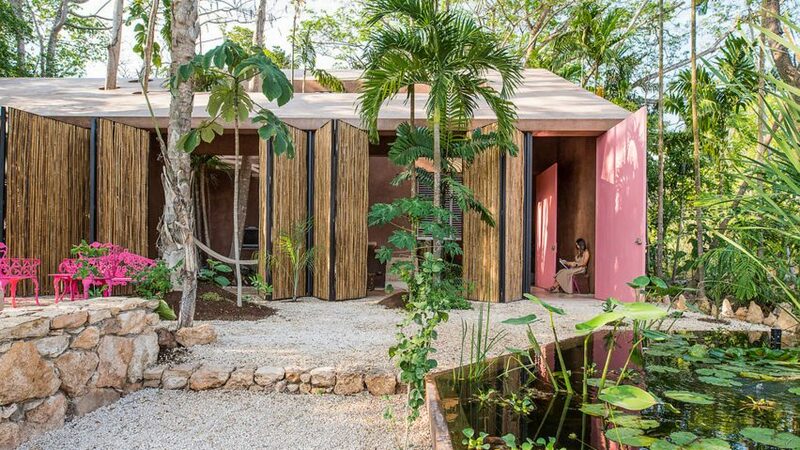 Mexican architecture firm TACO has designed the Portico Palmeto studio to act as its headquarters, with pink walls, local materials, and tall shutters that open up the interior to its tropical setting. The 1,453-square-foot (135-square-metre) rose-coloured building serves primarily as an architecture studio in Mérida – a historic city on Mexico's Yucatan Peninsula. The two-storey structure has a hollow centre filled with lush foliage, similar to its surroundings. 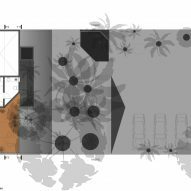 Taller de Arquitectura Contextual, or TACO, led the entire project for itself – encompassing architecture, construction, landscaping and interior design. "The objective was to develop a way of living in a natural and social environment, and at the same time of being a functional, versatile and inspiring building for the activities that would be developed in it," said TACO. 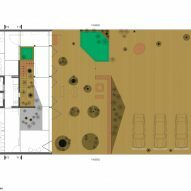 The architects wanted to stray from the notion of conventional workplaces and create a more homely atmosphere within the building. "The spaces were designed away from a stereotype related to a traditional workspace, and focus on making the experience of working in it more welcoming and domestic," said the studio. On the ground floor are rooms for working, along with a kitchen that overlooks a small courtyard. Outdoor steps lead to living areas and two bathrooms, as well as an open-air roof terrace. Part of the project's name, Palmetum, means a place where palm trees flourish. Many of these have been integrated into the building, which has circular holes in the ceiling for the trunks to reach up through. 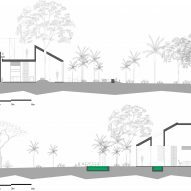 The structure is also located near a plant nursery, Vivero Cholul, in the heart of a historic Mayan-colonial community. "For the visitors, the objective was to establish a sensorial connection with architectural-constructive values promoted by the workshop," said TACO. 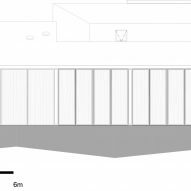 The bamboo panels that run across the front of the studio – which open and close to control privacy, security, and sunlight – were produced locally. Burnished stucco lines all of the walls and ceilings, and was naturally pigmented with the earth from the site. The overall design takes cues from Mayan vernacular architecture, as well as local Franciscan convents and Yucatan haciendas. "The construction system – based on blocks, joists and cement slabs – is the most common in the region," said TACO. A flat roof was cast in-situ with waterproofed concrete and is thermally insulated with polystyrene panels, while hydrosanitary facilities separate grey and black water on-site. Construction materials were chosen for their ability to weather naturally, and stand up to the heat and moisture of the region. White concrete lines the floors, with gaps among them to remove moisture from the ground. Hardwoods were used for carpentry and are naturally resistant to termites, while windows comprise aluminium frames and tempered glass. All interior spaces include mosquito nets, with water pools also functioning to control insects, alongside native fauna. The soft, pink colours of the project were chosen to relate to the native vegetation, and to attract wild birds and other local species. 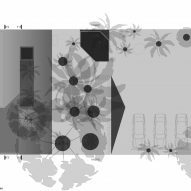 "Its aspiration is to be a syncretic building capable of abstracting the qualities of a regional architectural heritage," said TACO. The tropical Yucatan Peninsula sits between the Gulf of Mexico and the Caribbean Sea. 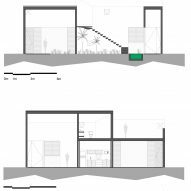 Other projects in the region include the newly built IK Lab art gallery in Tulum, Casa Sitpach with its outdoor hallways, and a boutique hotel in a property once owned by infamous drug baron by Pablo Escobar. Photography is by Leo Espinosa.